I do take the occasional repair, although I prefer to build new canoes. Canoe repair is a slow (and therefore expensive) undertaking. I prefer to teach others to do it themselves! Peter and I had fun this fall traveling to Idaho to help teach a bunch of 50 something camp councilors how to repair their camp's old canoes. Hire us to teach a class. Or contact me for advice; I am happy to help you and would encourage you to do it yourself. Luckily, I'm not the only person who can help you restore your precious craft. In Ely, you can try Wayne Fredricks at 218-340-4663 (cell) or 218-365-7889. Dan Strootman of Danncraft Canoes in Wilmar, MN and Alex Comb of Stewart River Boatworks also do quality repair work. Perhaps you want to consider a fun working vacation on beautiful Lake Superior. 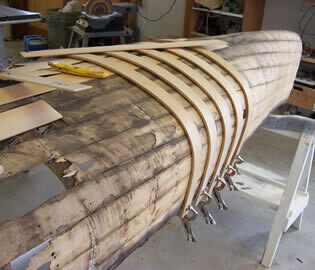 Consider the "Repair your own canoe" classes at the North House Folk School, in Grand Marais, MN. I learned to build from Jerry Stelmok so if you are one the East coast you can start with him at Island Falls Canoe. Rollin Thurlow, Northwoods Canoe Company, also in in Atkinson, Maine, is probably the biggest volume repair guru in the business and he is also the quickest source for supplies . For more suggestions, look at my links page. Also consider checking the Wooden Canoe Heritage Association (WCHA) builder's directory for someone close to wherever you call home.